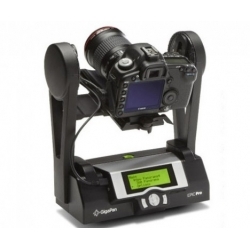 DSLR Compatible EPIC Pro works with almost all DSLR cameras. Large lenses are supportedCamera and lens combinations of up to 10 lbs can be used with the EPIC Pro. Precision accuracy Powered camera movement and simple fore/aft up/down adjustment for optimal positioning of the nodal point and varied camera/lens combinations. Quick set up Easy to secure EPIC Pro to tripod. Fits standard tripods with 1/4" thread. Onboard bubble level for horizontal alignment. Clear and simple to navigate menu Access frequently-used functions with the touch of a button, such as to move the camera or set the shutter delay. Screen is highly visible with back lit display. Strong and durable yet lightweight Excellent design with magnesium chassis and aluminum arm, the EPIC Pro weighs less than 8 lbs. New firmware gives photographers a wider range of functions, including new settings to enhance high dynamic range (HDR) imaging. Exposure Bracketing for HDR Capture – Works with your camera’s AEB (automatic exposure bracketing) firmware to capture multiple exposures per position. Can exceed the camera firmware's brackets and exposure separation when in 'Bulb' mode. Dedicated Mirror Lock-up Setting – Helps prevent blurriness in photos when using larger, heavier lenses, where lack of settling is amplified by optical magnification. Time Display – Displays the hours and minutes it will take the EPIC Pro to capture a panorama, based on your settings. Ideal for time-sensitive shoots, such as events, or when remaining daylight is limited. Time Lapse Panoramas – Allows you to capture a sequence of panoramas over a set period of time with a new timer. Additional Aspect Ratios – Provides custom values (0.50:1, 0.55:1… through 2.00:1) in addition to standard values: 1:1, 3:2, 4:3, 16:9. Rechargeable battery pack (7.2V, 4300mAH) Charge the battery on its own or while inserted in the EPIC Pro, convenient for charging while shooting. Battery pack and charger included. Multiple Triggering Option Allows the EPIC Pro to take multiple pictures at each image location up to 20 times per position for exposure bracketing or multiple image enhancement. Optimized range of motion 360 panoramic and -65/+90 tilt range of motion with precision incremental movement. Remote trigger port Enables you to start taking a panorama from a different location using a remote trigger switch (not included). Settings include: Option to repeat last panorama, pause and scroll, and order pictures as rows or columns. Adjustable features include: Time between exposures, motor speed, aspect ratio, and picture overlap. Precision movement The pan-tilt precision for the EPIC Pro is 0.04 degrees/step for tilt and 0.12 degrees/step for pan. Electronic Trigger Cable Seven cables are provided when you purchase the EPIC Pro.